Increasingly, consumers will be able to find end-to-end solutions that comprising several products – hardware, software, and app- or Web-based. We’re evolving toward complete solutions that allow people to track their activity, follow guided fitness routines, and then learn new habits from Web sites that aggregate these feeds and present clearcut action steps toward achieving goals. That’s a lot more than consumers have ever had before. Angel is developing a very interesting body monitor – their device is a wrist band that contains several different sensors (acoustic, optic, acceleration, & temperature) and here’s the twist: it’s meant to serve as the physical platform for what software developers might load onto it. So, if you were a large employer, health insurer, hospital chain, or you represented some sort of “large population”, you’ll now be able to configure the functions that you’d like to see installed on the Angel band that you distribute to your group. IBM could configure the functions that it thinks are important to their employees’ health. Walmart could do the same thing, but tailor what’s measured to suit what they think is important. Depending on a lot of things (including the un-announced price), if you’re not happy with the feature sets offered by the current products on the market, you can now create your own personalized set of functions to keep track of what’s most important to you (if you’re a developer). Not only that, but with firmware updates you could even re-configure your device’s functions – instead of buying a different product and potentially learning a new Web site for interpreting the results. Very neat – we’ll be following Angel‘s evolution. Within the body monitoring industry, even the more clinical end like Intel-GE gear (vs. Jawbone, Nike, etc. ), administrative approvals like 510(k) don’t carry much weight. They’re good to have, but they’re more like “yeah, we’ve all got them”. Consumers don’t know this – when they see “FDA Approved” it conjures up something credible. I researched this issue for the Body Analysis Scale review and what I learned made me uncomfortable with this practice. Thanks to mobihealthnews for being on top of this. BMR’s review of the Basis B1 has just been published here. It’s a very interesting device due to its inclusion of an HRM (Heart Rate Monitor) that periodically samples your heart rate 24/7, and sensors for skin temperature and perspiration. I found myself captivated by Basis’s Web site presentation of the data, trying to recall what I was doing, or how I was feeling when when my data spiked or changed. If you’re looking a wrist-wearable activity tracker that includes heart rate functionality, this is worth checking out. Read more in the review! Factory Reset Function – Thank You Polar! As a reviewer I cycle through a number of devices. When I’m done I hand them off to my teammates for them to use, comment on, and generally form their opinions and perspectives. A factory reset function, or an erase function, or any function that returns the device to its out-of-the-box settings is very helpful to me – and I suspect to anyone who ever sells or gives their device away. It’s not the biggest deal in the world, but a reset function eliminates headaches, provides my teammates with a “clean” device, and I suspect I’m not the only one who’d like to see this. My Polar Loop has just arrived – hurray! I’m pretty excited about this because the Loop is one of three devices I’m looking forward to reviewing as the retail season kicks off. 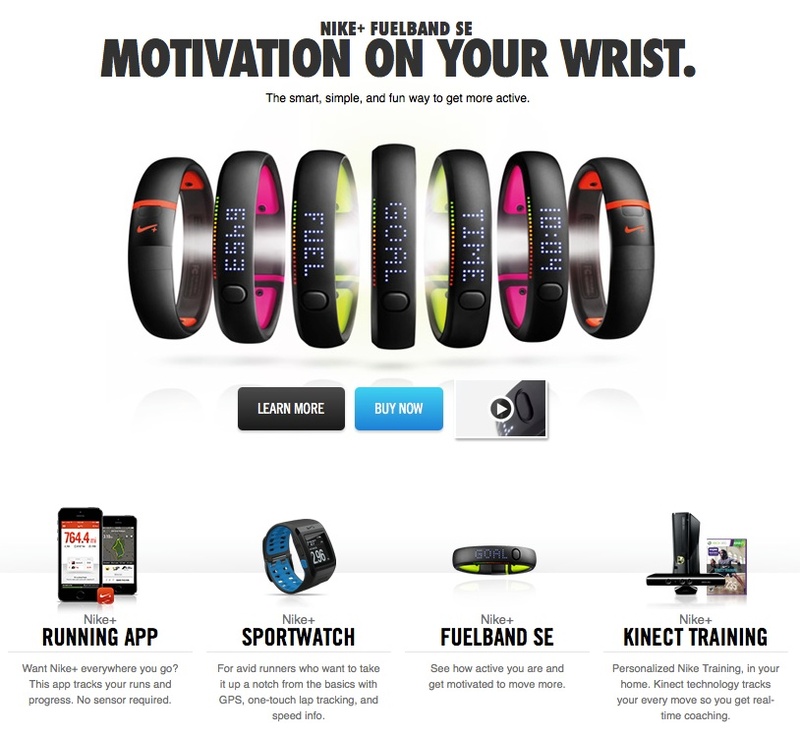 The other two are the Nike+ FuelBand SE and the Fitbit Force. I’ve been a Polar customer for years (a trusty FT80 & various chest straps,) and I’ve been impressed by their gear and as well as by their online and app presence. Among other things, I’m expecting the Loop to be a durable, hardwearing piece of gear that looks good too. My first impression out of the box? I’m pretty happy. But here’s what’s got me jazzed – the Loop is compatible with Polar’s chest straps, which, as consumer-accessible technology goes, is a very accurate way to continuously track & record your real-time heart rate. I’ve been using a heart-rate based approach to fitness for years and I wish I’d started sooner. Stand by, there will certainly be more to come. Runtastic gets our attention today thanks to its introduction of its body analysis scale called LIBRA. The company continues to evolve from being purely an app maker to developing a credible line of fitness (hardware) products. We’ll get our hands on their gear and run them through our analysis – it’ll be very interesting to follow Runtastic’s progress. The Jawbone UP was my first experience using an activity monitor. Overall I loved the device, although I fear I delved into the features perhaps too much and I have undone myself a bit. More on that later. Based on my research on Activity Monitors, I was most fascinated with the Jawbone’s ability to analyze my sleep, as well as it’s ability to wake me when I was not sleeping ‘deeply’ (in REM sleep). Although this requires a little flexibility in your wake up time (you bracket your ideal wake up time with plus or minus 10, 20 or 30 minutes, letting the device wake you when you are sleeping ‘lightly’) I was surprised by how the buzzing band woke me, no problem, no audio necessary. The big sleep question for me was did the flexible alarm make me feel “fresher”? And to be honest, I can’t really say. While some of my friends crow about this feature, I was left scratching my head. Perhaps the discovery that I sleep an average of seven hours a night (often less) had me too groggy to tell. Over the course of my ten day experiment, the buzzer never woke me more than four or five minutes before my target wake-up time, despite setting a ten minute +/- flexibility window. Finding my way into the second level of settings was not easy. It was also challenging learning to trust the monitor to wake you as you can’t confirm that it is set like an alarm clock, by pressing one button and seeing the alarm time, you must go through the process of syncing it to your phone. An immediate blue tooth connection would certainly make this device more desirable. We’ve just posted our review of the Shine – a high style entrant in the activity monitor space. The functionality is limited and focused purely on capturing your activity levels when awake and asleep. The device’s minimalist approach extends to its mobile app and the lack of a Web site where you can check your progress. Nonetheless, if you find some of the activity monitors available today to be “aesthetically challenged”, the Shine could be a possibility for you. Read the full review here. Hold on – “consumerization” is repeating itself – in the realm of healthcare. We’ve seen this theme play out in Information Technology (IT) and how people use their own devices in otherwise uniform workplaces. For some people the term BYOD (Bring Your Own Device) is a blessing because it means they can use their own phone, tablet, or even computer instead of accepting the standard-issue gear that might come from their employer. The gear consumers buy is often better than what a company might issue. Presumably the additional capabilities improve productivity, performance, and satisfaction. By using their own (and familiar) devices, people can follow well-learned routines for checking email, calendars, and messages without having to learn a new device. If you’re an IT manager, your nerves may get a little frazzled worrying about security, device life cycles, uniformity, and compatibility across a diverse installed base. If you’re an employee, you’re now always available because by definition you’re carrying your work and personal device with you all the time. Doing so reduces the ability to say “I didn’t get your phone call/voice mail” or “I didn’t see your message”. In other words, depending on your company culture, you may now be on call 24/7. Within the realm of healthcare, health, and wellness there’s been a burst of activity in the form of products that allow you to track yourself, store that data, and share it if you want to. While the consumer experience with these self-tracking products is getting better all the time, the pain of integrating these data with the rest of the “healthcare system” may be just beginning.